Your information is safe with us and used only to migrate your data to Freshdesk. Spend only twenty minutes setting up the migration, the rest will be done for you. Transfer support tickets along with all vital informattion like agents, customers, etc. Our software was built to provide you with an easy to use data migration tool that helps to get the work done seamlessly. 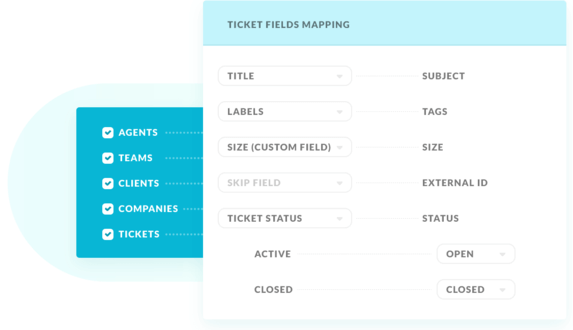 All tickets will be imported to Freshdesk with their respective agents, contacts, and attachments, as a result, saving the history of customers' requests. Sign up and proceed to the next step. Choose the software you want to migrate from and connect it with our tool. Grant access to your Freshdesk account. Make a decision on which data have to migrate and which have to stay. Import a small amount of support tickets to see our software in action. We take security and safety very seriously and have developed a complete set of practices , technologies , and policies to help ensure that your customer support data is protected.